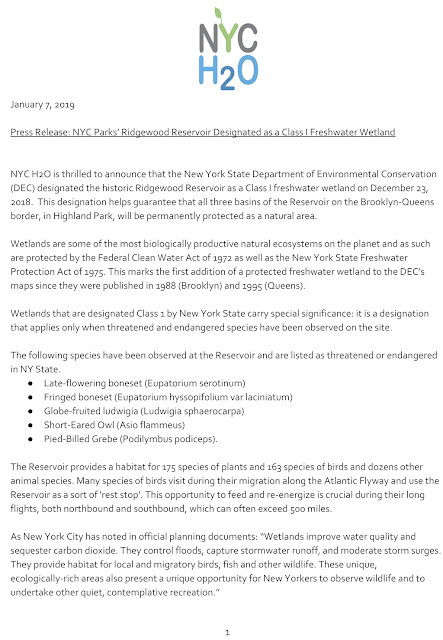 With the Ridgewood Reservoir finally being designated as a historic landmark and the majority of it's 50 acres now protected as wetlands, it is time to wrap things up here. My first posting was on March 7, 2007. Unless things change, this will be my last. The blog, however, will remain online as an archive of the community struggle to protect this special place. Thank you for your support. 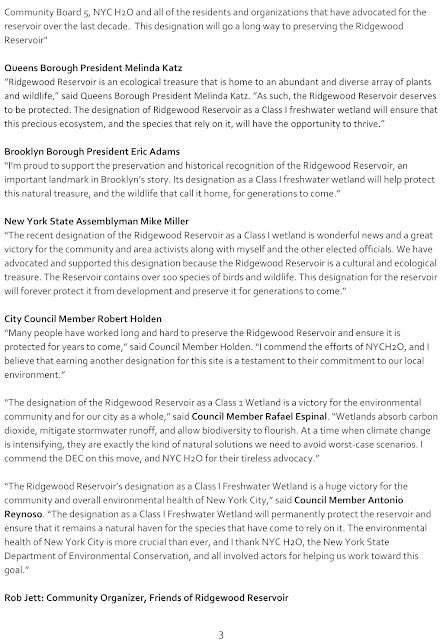 Good morning, Steve, and congratulations upon the Ridgewood Reservoir wetlands finally having been recognized as worthy of protection. I have a few recollections of those February days in 2009 when I spent much of my time among the reservoir basins . It was fairly easy to rappel down the sides of the basin; the real challenge was climbing out again after a long day among the wetlands. 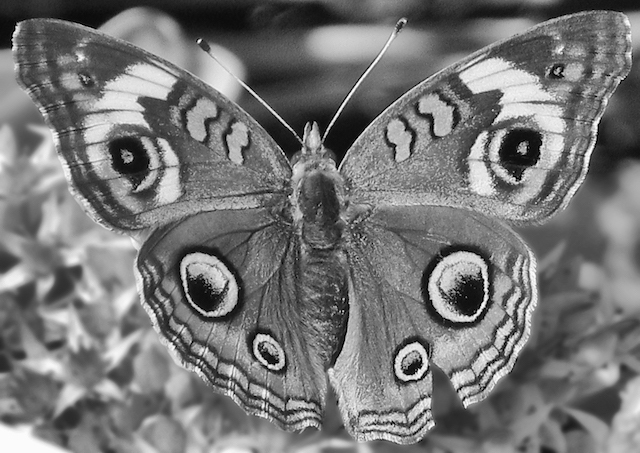 The pleasure of spending hours taking soil samples and matching color with those depicted in the Munsell Soil Color Charts, drilling two-feet deep cores, identifying dozens of plants solely on the basis of winter buds, and occasional surprise discoveries, such as the spying a buckeye butterfly, Janonia coenia, sunning itself in a protective niche of a birch tree. February days were short, requiring an early start to avail myself of limited daylight, so I’d conserve time by dining on peanut butter and jelly sandwiches washed down with coffee or tea or whatever Barbara stored in my thermos. The experience was physically uncomfortable at times but mostly joyful in ways that only a solitary naturalist might understand. I had little confidence at that time that years later the entire complex might be recognized by today's authorities as the ecological gem that it is, and I thank them, Rob Jett and you for making that a reality. 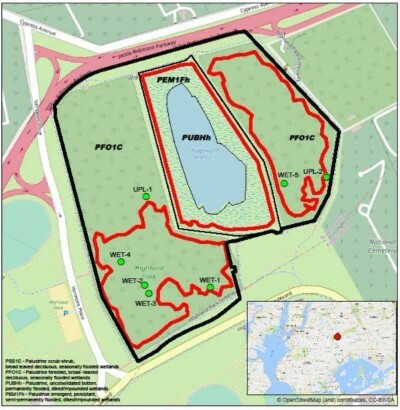 PROTECTION FOR THE RESERVOIR AT LAST!!! 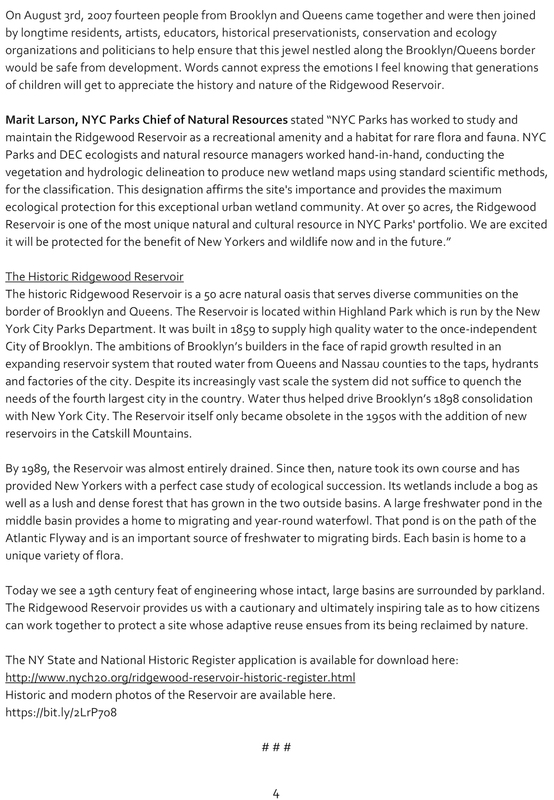 The Ridgewood Reservoir Wetlands Declaration can be read in its entirety HERE. DEC has found that “The majority of the western basin (Basin 1), as well as the majority of the southern half of the western basin (Basin 3) contain forested wetlands that are seasonally flooded. The majority of central basin (Basin 2) contains open water, surrounded by emergent wetlands…” The comment period on the wetland designation starts today and will close on March 22nd. A copy of DEC's The Ridgewood Reservoir Wetlands Report is available for download here. The National Park Service moved rapidly to add the Ridgewood Reservoir to the National Register of Historic Places on February 2, 2018. The Reservoir was listed on the New York State Historic Register on December 7, 2017 with Federal approval initially anticipated for April, 2018. 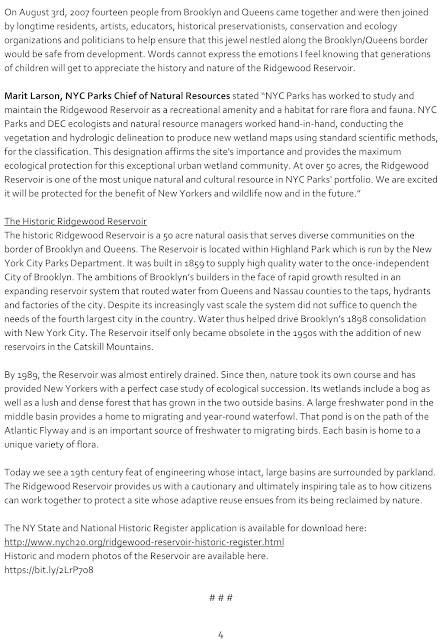 NYC H2O, a nonprofit that provides education programs on New York City’s water system and ecology, wrote the Historic Register Application for the Reservoir. Since 2014, NYC H2O has brought 3,000 Brooklyn and Queens students on free Water Ecology and Engineering field trips to the Ridgewood Reservoir to experience New York City’s water system up close and learn to appreciate their city’s reliance on natural and engineered systems for clean water. The historic Ridgewood Reservoir is a 50-acre natural oasis that serves diverse communities on the Brooklyn/Queens border. The Reservoir is located today in Highland Park, which is run by the New York City Parks Department. It was built in 1859 to supply the once independent City of Brooklyn with high quality water. Its increasingly vast scale still did not suffice to quench the needs of the fourth largest city in the country. Water thus helped drive Brooklyn’s 1898 consolidation with New York City. The Reservoir itself only became obsolete with the addition of new reservoirs in the Catskills in the 1950s. By 1989, it was mostly drained. Since then, nature took its own course and has provided New Yorkers with a perfect case study of ecological succession. A lush and dense forest has grown in the two outside basins—each with a unique variety of flora—while a freshwater pond with waterfowl sits in the middle basin. That pond is on the path of the Atlantic Flyway and is an important source of freshwater to migrating birds from nearby Jamaica Bay. Today we see a 19th-century feat of engineering whose intact, large basins are surrounded by parkland. The Ridgewood Reservoir provides us with a cautionary and ultimately inspiring tale as to how citizens can work together to protect a site whose adaptive reuse ensues from its being reclaimed by nature. “As a strong supporter of preserving the Ridgewood Reservoir, my thanks to NYS Parks for adding this wonderful site to both Historic Registry lists” said Assembly Member Catherine Nolan. “Thank you to Governor Andrew Cuomo, NYS Parks Commissioner Rose Harvey, Queens Community Board 5, NYC H2O and all of the residents and organizations that have advocated for the reservoir over the last decade. 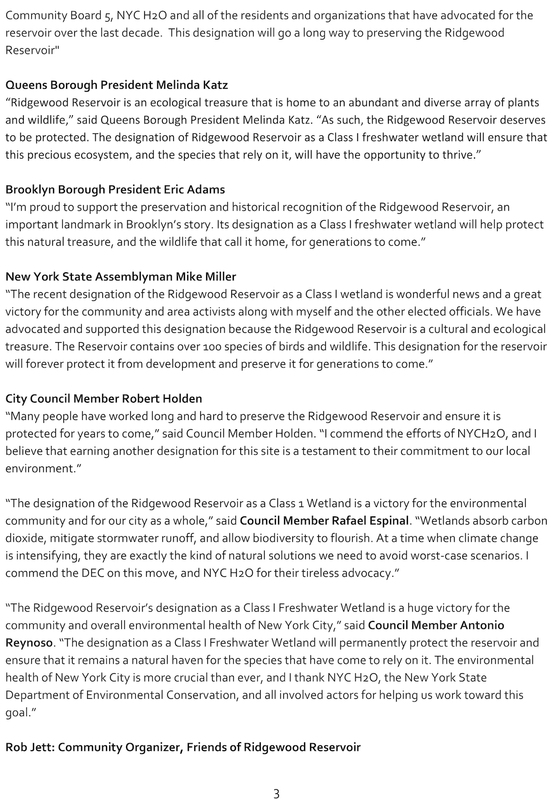 It is important to preserve the Ridgewood Reservoir for future generations”. 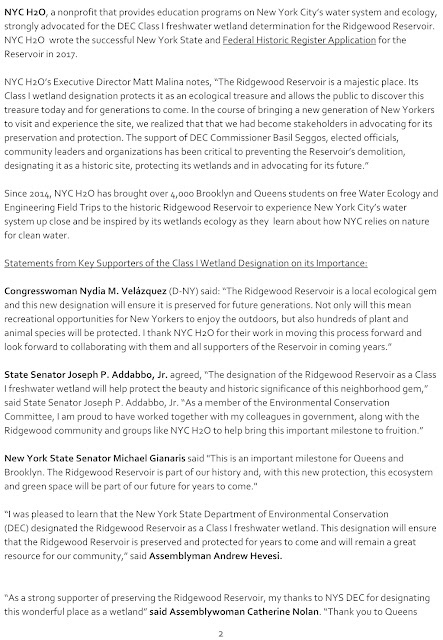 “The recent listing of the Ridgewood Reservoir on the National Register of Historic places is wonderful news and a great victory for the community and area activists along with myself and the other elected officials. 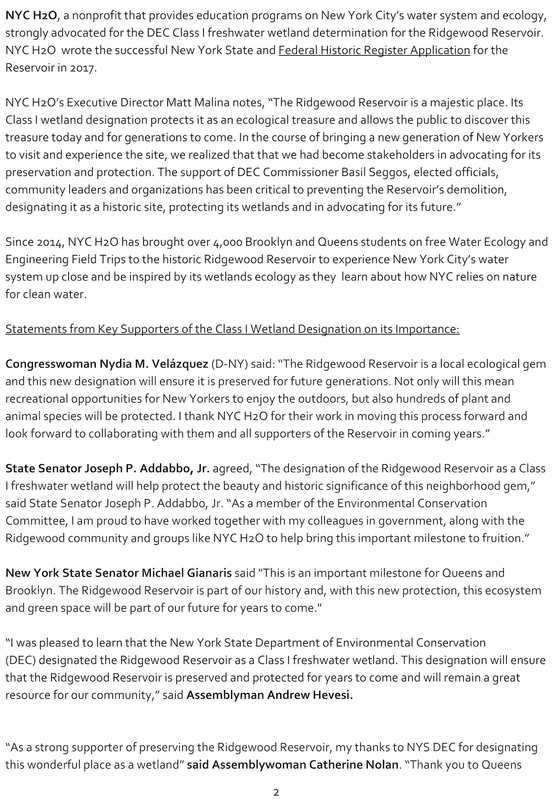 We have advocated and supported this mission because the Ridgewood Reservoir is a cultural and ecological treasure. The Reservoir contains over 100 species of birds and wildlife. This special listing for the reservoir will forever protect it from development and preserve it for generations to come,” said NYS Assembly Member Mike Miller. “I have always believed that it is important to protect our cultural treasures. 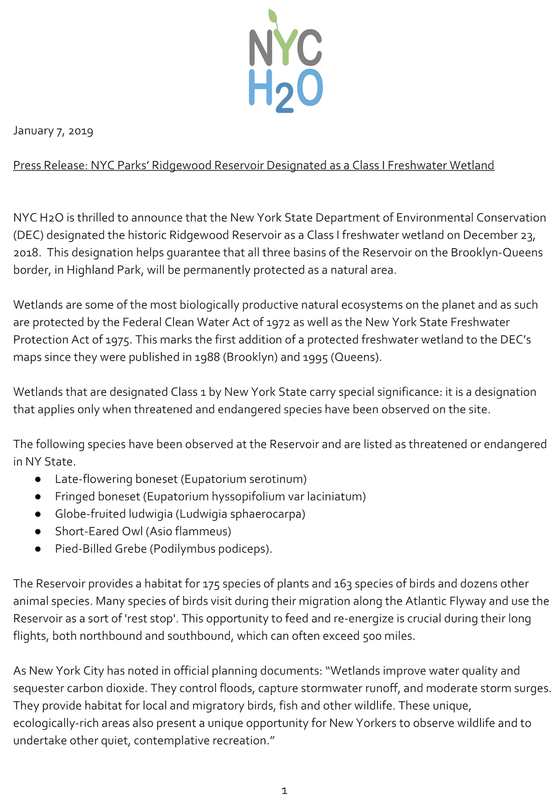 I’m proud to have supported the listing of this site to the New York State Register of Historic Places, and now the National Register of Historic Places, both of which will preserve this wetland as an excellent environment to study nature and Brooklyn’s history for future generations. We thank NYC H2O for taking the lead in writing the Historic Register proposal,” said Brooklyn Borough President Eric Adams. “While the Reservoir no longer provides necessary water supply to residents, it stands as a testament to the ingenuity of New Yorkers, who, when faced with a problem like a water shortage, undertake stunning engineering and urban planning projects in order to create solutions. I am so grateful for the efforts of local advocates, under the leadership of NYC H2O, in securing protection for this incredible site,” said City Council Member Robert Holden. Ridgewood Reservoir Gets Historic Recognition! From our friends at NYC H2O. Please attend the City Council hearing on sewage infrastructure this Wednesday and consider giving testimony. The City and State need to hear how concerned waterway advocates are about the lack of transparency in the approval process and the proposed plans for stormwater infrastructure. When finally implemented in 2030, the current plan will leave 20 billion gallons of raw sewage in our waterways each year. The NYC DEP and NY State (DEC) did not provide the public with an opportunity to voice our concerns about the City's flawed Combined Sewer Overflow Long Term Control Plans before they approved them in March of this year (see the SWIM Coalitions's fact sheet about this here). We need to call on the City Council to ensure that NYC gets raw sewage out of our waterways. Please pass the word about the hearing to everyone you can and let us know you're coming by joining the SWIM Coalition's Facebook Event here!